Disclaimer: As an Oriental Trading Brand Ambassador, I receive product for review purposes. As always all opinions and words are 100% my own. One of the best parts of Halloween for me is seeing the kids all dressed up and saying Trick- or- Treat and the worst part is going somewhere when Trick-or-treating has just started and there is a sign that says all out of candy. No, I don't mean houses I mean store fronts, pharmacy store fronts to be exact. We spend so much money at certain places through out the year and to go on Halloween and see them not want to invest a little bit for the kids really is bad and has made me not shop at certain places anymore. Oriental Trading makes it very easy and affordable to buy candy or other fun goodies to give out on Halloween. 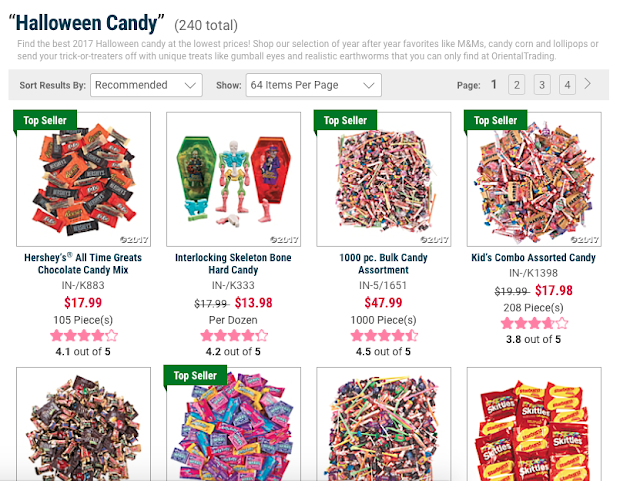 Candy is not for everyone, I know there are other options available to give out on Halloween night and Oriental Trading has a great variety of goodies. Look at all the candy options, 240 to be exact. it was definitely hard to pick a few items for Halloween. I wanted all, not only did they look yummy but they would make great decorations. These are the ones we picked out. Who could say no to those funny monster pops. What about marshmallow eyeballs full of jelly. of course you also had your traditional candy like tootsie rolls and chocolate covered skull heads. Great for teachers who like to give their students little treats on Halloween or for kids who love giving out Halloween cards to their friends. 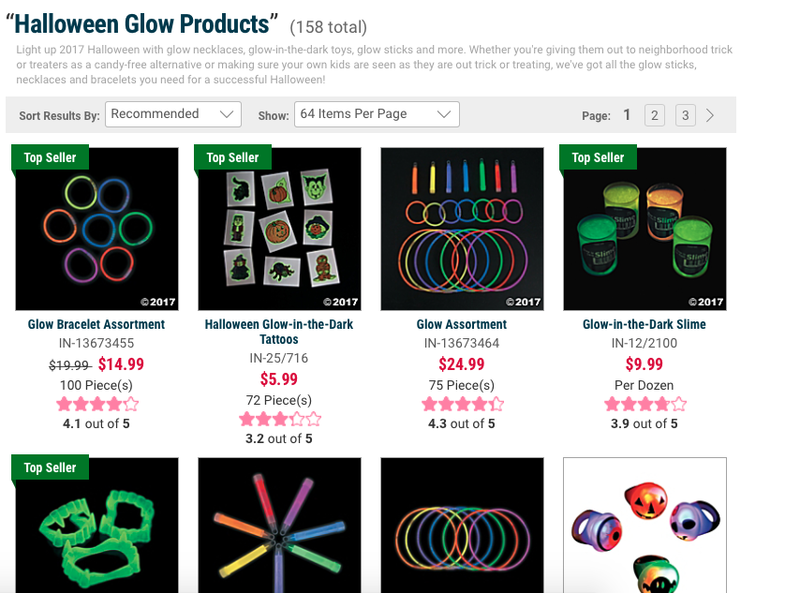 They also have a great Halloween Glow section, with 158 products to be exact. We made sure to order a few fun items that will be sure to come in handy. Some glow in the dark tattoos that are fun all year fun, some flashlight for trick or treating and to give out to little ones that we pass by who might need more visibility, a fun UFO Lamp for decorating, definitely a fun 90's memorabilia and some skeleton gloves that glow in the dark perfect for trick or treating and this upcoming winter. Last but not least, these little skeletons that are like slingshots. These are definitely great for trick or treaters, as a non candy treat. Oriental Trading has a great selection of Halloween Candy and Halloween Glow items, make sure to check them out and buy some goodies. Halloween is right around the corner and you wan too be ready. 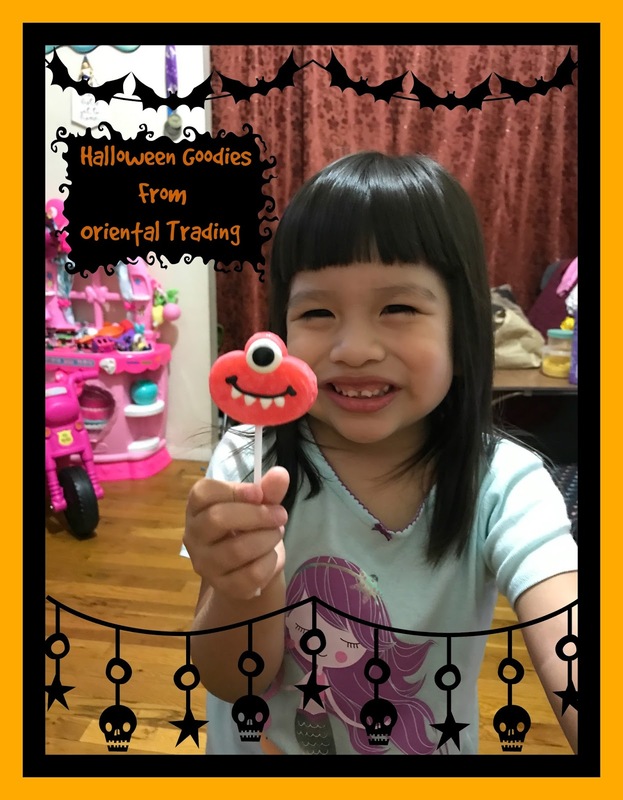 The candies are definitely kid approved, just look at Valentina's face with her goofy monster pop from Oriental Trading. Which was only $4.99 for 12, definitely a steal. 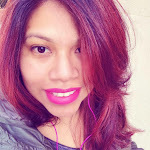 Everything comes carefully wrapped and if something is wrong with your order all you have to do is contact Oriental Trading and they will help you.